Here are the top 5 things to know when buying a guitar for a beginner child. What type of guitar is best for young children? Should I buy an acoustic, electric or classical guitar for Christmas? As a professional guitar tutor, running classes in Glasgow’s West End and Bearsden for over 14 years, I have been asked this question many times. Getting the correct fit is essential, as a guitar which is too big or too small will hamper their progression – leading to frustrated children with painful shoulders! The quality of kids guitars has really dropped over the past few years. As demand to learn guitar rises, greedy manufacturers have drastically reduced the materials they put into their guitars – leading to dissapointing instruments which simply do not last. Guitars I would once recommend without a second thought, are now replaced with cheap imitations at the same or higher price, simply with the same logo put on it. This article will help you avoid wasting your money and choose a great first guitar which will last for years or at least until they grow too big and need a larger size. First, let’s discuss which types of guitars there are and which are best for beginner kids. 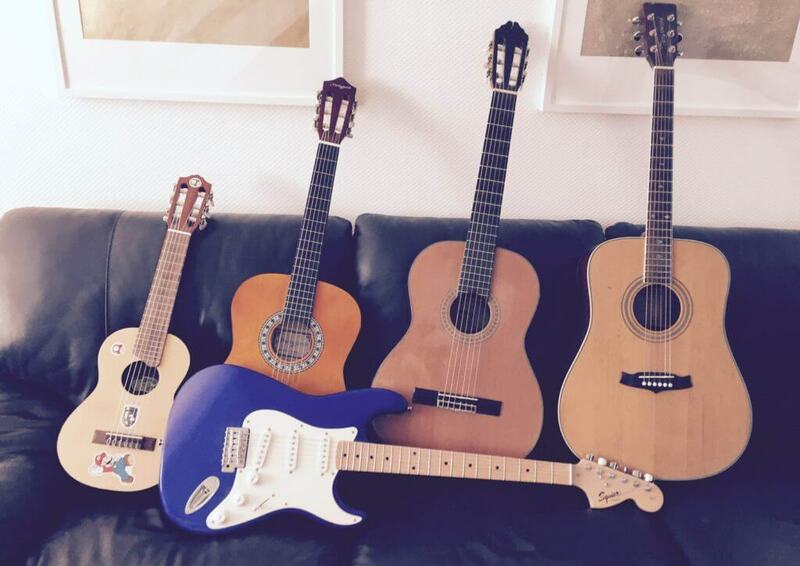 Guitars come in three main types: Acoustic, Classical and Electric. What’s the difference between an acoustic, classical and electric guitar? An acoustic guitar has thick metal strings, is bigger, has a thinner neck, is louder and takes a little more skill and finger strength to play. A Classical guitar. Beautiful, soft sounding and easier for beginners to play. A Classical guitar (sometimes called a Spanish guitar) has a mixture of very soft plastic strings and nylon strings, is smaller, gives a more subtle, warm sound and usually a wider neck. The soft strings make a classical guitar easier to play. The guitar most kids aspire to play. The probably aspire to play AC/DC! Electric guitars require an amplifier, to be plugged in via an electricity source and a cable between the guitar and amp. They are easier to play than acoustic guitars, though harder to play than classicals. Electric guitars give the ‘rock’ sound, but can also closely mimic that of an acoustic. They have metal strings which are thinner than those on an acoustic. What type of guitar should I buy for a young child to learn guitar? In a nutshell, From the range of instrument types above, the best for a beginner would be a 3/4 (three quarter) length classical guitar as they are the easiest for small fingers and hands to play as the strings can be pushed down easier, causing the least discomfort to the child. Buy a decent quality guitar – cheap is cheap for a reason! Buy a varnished wood guitar. Paint hides problems! A lot of guitars for sale online and in shops aren’t real instruments, but more glorified toys. No company really invests in good quality, good playing half size guitars. This is because as they figure as the children playing it will be really small and young – there’s no point making it a quality instrument. This leads them to making the types of toy guitars mentioned above in tip number one. they overlook the fact some kids this age are actually genuinely learning to play the instrument in lessons. They will outgrow the guitar a lot quicker. This leads to a guitar which is hard to play as their fingers are squashed on the fingerboard (the boxes on the long neck) and they have to hunch over to play it. This can cause discomfort which the child begins to associate with playing guitar. A lot of kids will want to go straight onto the electric guitar, while most adults will assume they should buy an acoustic with metal (steel) strings. it’s the name of the classical guitar which throws most. A classical guitar isn’t just for playing classical music! Start the beginner learner kid out with a 3/4 size classic, like the examples above. If they really want to learn to play rock music (and your ears can suffer it as they learn and sound, eh, noisey!) – choose an electric. Even thought it’s not exactly my number one choice for beginner kids, if it’ll keep them stimulated and excited to learn – go for it. 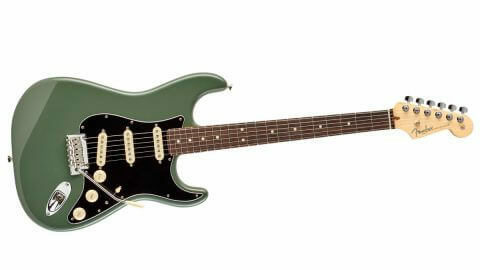 Cheap guitars are harder to play as the strings are further away from the neck (the part they press down on), which makes pressing the strings down harder, ultimately making the guitar harder to play. This will lead to the young one getting sick of trying hard only to struggle and will probably eventually give up. They are made from very poor quality materials and will perish in no time. Electronic components will be very quickly and poorly soldered and be of poor quality. The main thing which happens is the socket which accepts the lead to plug into the amplifier, comes away due to shoddy wiring. To take this to the guitar repair shop to fix could end up costing more than the guitar itself. I’ve seen it happen! On the other side of the coin, don’t go buying an expensive guitar either, even if you have the money – a nice squire will do fine! They can work up to more costly models. Paint is great thing for cheap guitar makers. It means they can make sub par, poorly constructed instruments and simply paint over the evidence. If your son or daughter insist on having a coloured guitar, instead offer to have them customise the guitar with stickers, transfers or even sharpies! Don’t be precious over this, the main thing is to get them playing and enjoying the process. Have them do it on a good guitar! Electric guitars are almost always painted, so this point doesn’t really apply to electric guitars, further backing up the ideal guitar to start with should be a Classical. If all you can afford is a super cheap guitar, then go for it – it’s best a child plays with something over nothing. If you can afford it, or wait a little while till you can, a decent 3/4 size classical guitar is best, followed by a 3/4 size electric with a 15 watt amp and decent L-shaped cable. Avoid 1/2 size guitars and try not to start them out on metal-stringed acoustic guitars. If you would like any help or advise on buying a guitar for you child for Christmas, a birthday or simply a gift. Please feel free to get in touch and I will be more than happy to help.